I've been a happy customer of Door to Door Organics for quite some time now, probably for at least two years. Since it's just me and my two boys, I receive the Bitty Mixed Box, which is the perfect amount of fruits and veggies for the three of us. It's awesome because you can customize your box each week, making swaps if you'd like, and also adding other groceries to your order. I often add eggs and specialty breads, sometimes snacks, and pretty much every order you'll find Quinn's Hickory Smoked Cheddar Popcorn in my box. To say I'm obsessed with that popcorn is an understatement. Just ask my kids! Anyway, enough about my popcorn obsession! You can read all about the Door to Door service in my original reveal post. One of the recent trends is farm to table dinners. I'm sure you've heard about them before, but what it means is to bring fresh, local, artisanal foods directly to your table. 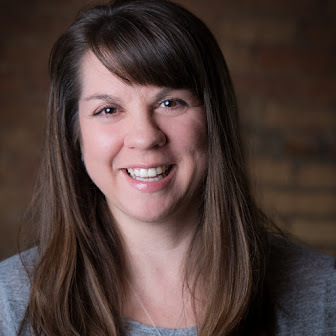 I hosted a farm to table dinner recently using a Local Farm Box plus a curated selection of local foods, courtesy of Door to Door Organics, and will be sharing some recipes with you today. The selection of goodies I received in my curated box was amazing, to say the least. Gorgeous heirloom tomatoes, Parmesan pepper bread, spinach fettucine, fresh chicken breast, creamy goat cheese, and the list goes on. Plus I added more beautiful fruits and veggies in my own box. I had so many beautiful things to cook with! But before we get into the recipes, let me start off by saying that hosting a farm to table doesn't need to be difficult or stressful. It should be fun and have a relaxing atmosphere. A place where people can gather to talk and share stories, laugh, eat good food and have a nice drink. It doesn't need to be complicated. My tablescape was simple. 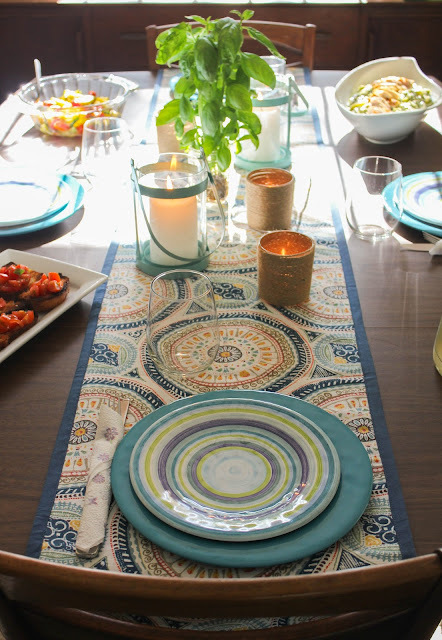 I already had this pretty blue patterned table runner at home. The plates I found on summer clearance at a local store. They are melamine, nothing too fancy. I also had the small candle holders in a closet, tucked away for just such an occasion. And the larger candle holders I found on clearance at Target. You'd be surprised at how many summer items are already on clearance, even though it's still summer! 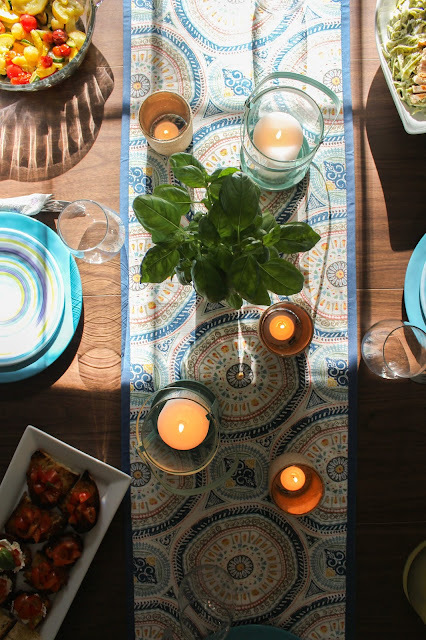 In the center of the table I have a small glass jar filled with basil. It was the basil from my kitchen counter. I love the fresh smell, and it didn't cost me a thing. It looks beautiful and it fit right in with the decor. So, are you ready to try Door to Door Organics for yourself? Well, you're in luck! 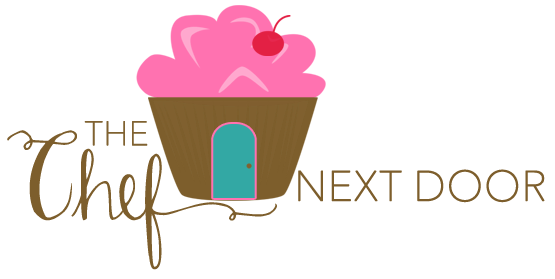 First time customers will receive 40% off their produce box order using the code Farm2NextDoor! Head on over and start shopping!! Now, let's get down to business with the menu! Here are a few of the delicious dishes I made that night. Preheat the oven to 400 degrees. Cut the slices of bread in half, so you are left with 12 pieces. Drizzle a bit of olive oil over each piece of bread and bake for 10 minutes, until the bread is nice and golden brown. While still warm, rub the bread all over with the cut side of the garlic. 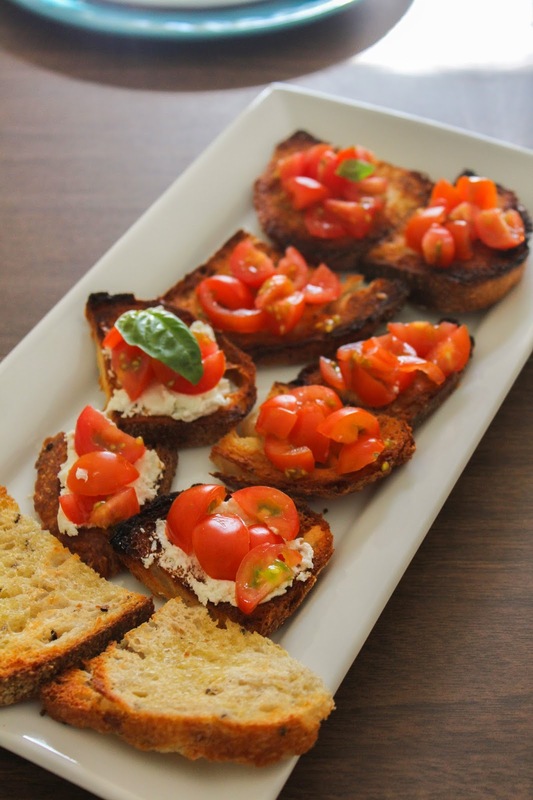 Spread a dollop of goat cheese on each piece, followed by a few of the cherry tomatoes. Top the bruschetta off with the fresh basil and a pinch of salt and pepper. Arrange on a platter and serve. 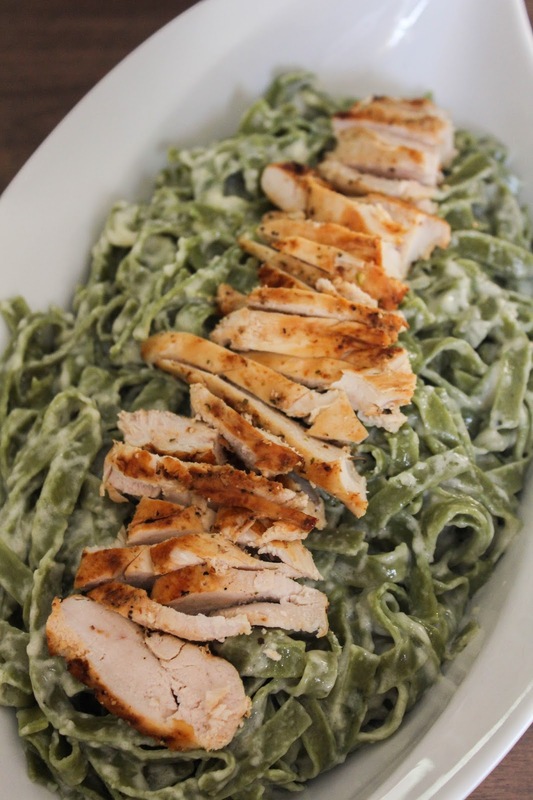 Our main dish was a delicious Spinach Fettucine Alfredo with Grilled Chicken. A simple homemade Alfredo sauce was the perfect bed for the tender and juicy grilled chicken slices. Again, nothing too complicated, and I wasn't in the kitchen long at all putting this together. Preheat the grill to high. Sprinkle both sides of the chicken with salt and pepper and grill until cooked through completely. (Chicken should reach an internal temperature of 160 degrees) Set aside to rest for 10 minutes. Once cool, cut into slices. Cook the fettucine according to package directions. While that's cooking, make the alfredo sauce. In a large skillet, warm the butter and cream over medium heat. Once hot, add the Parmesan and stir until completely melted. Add salt and pepper to taste. When the pasta is done, toss it in the pan with the sauce to combine. Add a little of the pasta water to thin it out, if necessary. Put the pasta in a serving bowl and lay the sliced chicken on top to serve. We also had roasted vegetables for a side, which are not pictured here. I roasted yellow squash, zucchini and cherry tomatoes in the oven with olive oil and salt and pepper until they were soft and starting to brown. Roasting the veggies makes them super sweet, which my whole family loves! I also made homemade lemonade to drink. Using fresh squeezed lemon juice, organic cane sugar and water, it was the freshest lemonade I've ever tasted. 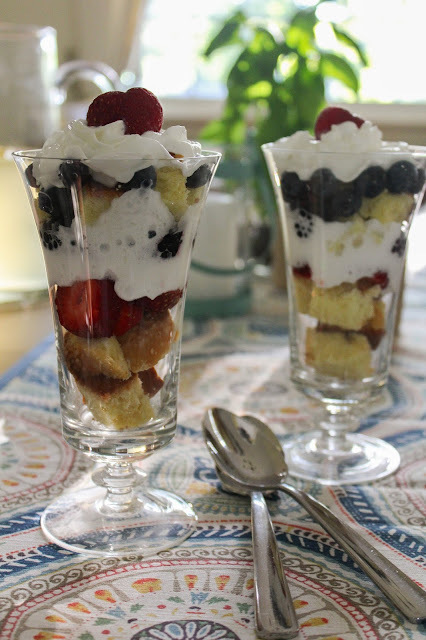 For dessert I made a homemade vanilla pound cake, then cut it into cubes and made individual berry trifles. Super light and refreshing, it was the perfect ending to our meal. Preheat the oven to 325 degrees. Spray a 9 x 5 inch loaf pan with baking spray and set aside. In the bowl of a stand mixer, beat the butter on medium speed until creamy. Gradually add the sugar and beat until light and fluffy. Add the eggs, one at a time, beating well after each addition. Add in the vanilla. With the mixer on low speed, gradually add the flour in a few batches. Add the cream of tartar and salt and mix in medium just until everything is combined. Pour the batter into the prepared pan. Bake the cake for about an hour, or until a cake tester inserted into the center of the cake comes out clean. Allow it to cool in the pan for about 20 minutes before removing it and allowing it to cool completely on a wire rack. Once cool, cut half of the cake into small cubes. 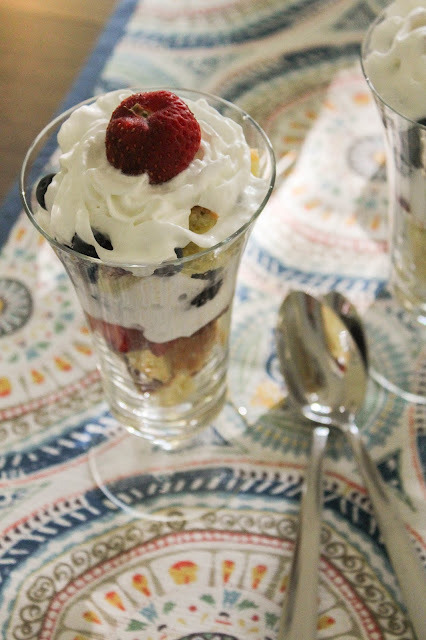 In parfait glasses or small bowls, layer cubes of cake with different layers of berries and whipped cream. Top with a dollop of cream and a strawberry before serving. The products I used are sourced locally as often as possible and come from a number of different local farmers. Be sure to check out the Local Shop section on the Door to Door website to see all of the local products available. Also don't miss out on trying Door to Door Organics for yourself! Remember to use the code Farm2NextDoor for 40% off your first produce box! Start shopping now! Thank you to Door To Door Organics for sponsoring this post! All opinions, as always, are my own. Thank you for supporting the brands that make this blog possible!